Jeffrey Tambor, Judith Light, and Kathryn Hahn brought Transparent to the 2017 Emmy Awards! The trio stepped out for the big night held at the Microsoft Theater on Sunday (September 17) in Los Angeles. Jeffrey was there with his wife Kasia Ostlun, whose dress matched her husband’s black and white tux. Judith stunned in a dramatic, floor-length black gown, and Kathryn opted for a strapless black dress featuring circular sequin designs. Both ladies attached blue ACLU ribbons to their outfits. Jeffrey received a nomination for Lead Actor in a Comedy Series, while Judith and Kathryn were both up for Supporting Actress in a Comedy Series. FYI: Judith is wearing a Christian Siriano dress, Jimmy Choo shoes, and Fred Leighton jewelry. Kathryn is wearing a vintage Courreges couture dress, Gusieppe Zanotti shoes, Beladora earrings, and a Tyler Ellis clutch. Jeffrey is wearing Montblanc cuff links and a watch. Jeffrey Tambor and his wife Kasia Ostlun pose for pictures as they arrive at the 2017 Screen Actors Guild Awards on Sunday (January 29) in Los Angeles. The 72-year-old actor was nominated for Outstanding Performance by an Actor in a Comedy for his role on Transparent. Jeffrey was joined at the awards show by his co-stars Judith Light, Amy Landecker, Jay Duplass, Kathryn Hahn, and Alexandra Billings. FYI: Kathryn is wearing an Adeam dress, Brian Atwood shoes, a Lee Savage clutch, and Jen Fischer jewelry. Amy is wearing a St. John suit, Jerome C. Rousseau shoes, and Effy jewelry. Justin Timberlake, Andrew Garfield, and Diego Luna were just some of male celebs who were looking sharp at the BAFTA Tea Party held at Four Seasons Hotel at Beverly Hills on Saturday (January 7) in Los Angeles. 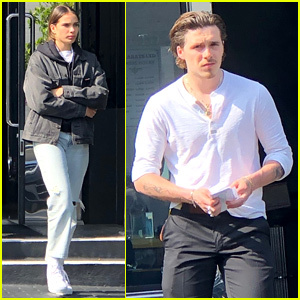 Also in attendance were Viggo Mortensen, Joel Edgerton, Riz Ahmed, Jeffrey Tambor, his wife Kasia Ostlun, Keegan-Michael Key, and his girlfriend Elisa Pugliese. Justin‘s “Cant Stop the Feeling” from the Trolls soundtrack is up for Best Original Song, Motion Picture, at the 2017 Golden Globe Awards tomorrow. Andrew, Viggo, and Joel are all nominated for Best Performance by an Actor in a Motion Picture, Drama, for Hacksaw Ridge, Captain Fantastic, and Loving, respectively. See what the rest of the guys are nominated for here. FYI: Diego is wearing Vince Camuto shoes. 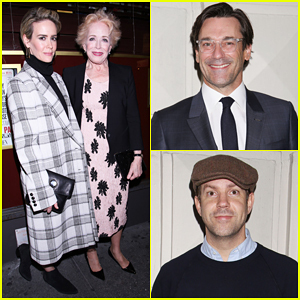 Sarah Paulson Supports Girlfriend Holland Taylor At 'The Front Page' Broadway Opening Night! Sarah Paulson is all smiles while posing alongside her girlfriend Holland Taylor at the Broadway opening of her new play The Front Page held at the Broadhurst Theatre on Thursday (October 20) in New York City. 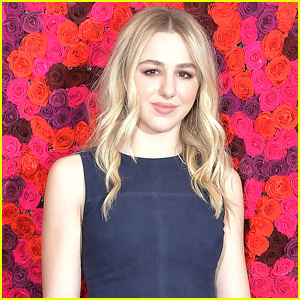 The 41-year-old actress was also joined by Holland‘s co-stars John Goodman, Nathan Lane, John Slattery, Dylan Baker, Christopher McDonald and Micah Stock. Also in attendance to show their support was Jon Hamm, Jason Sudeikis, Tyler Hanes, Matthew Broderick, Jeffrey Tambor, Al Roker, Billy Magnussen, Billy Porter, David Schwimmer and his wife Zoe Buckman. Jeffrey Tambor keeps close to wife Kasia Ostlun while arriving at the 2016 Golden Globe Awards held at the Beverly Hilton Hotel on Sunday (January 10) in Beverly Hills, Calif. The 71-year-old actor was also joined at the event by his Transparent co-star Judith Light. Jeffrey is once again nominated for Best Actor in a Television Series Musical or Comedy, which he won last year! Meanwhile, Judith is nominated for Best Supporting Actress in a Series, Miniseries or Television Film for the show too. Good luck to both of them! FYI: Jeffrey is wearing an Ermenegildo Zegna Made-to-Measure suit.